Jugg Life is an explosive fusion of dynamic live percussion and relentless energy with the breathtaking skills of two of Australia’s best jugglers and a combined 30 years of performing experience. As sound melds seamlessly with world-class technical ability, the performers display precisely what they love about juggling in every possible way, incorporating competition, danger, music and a Rubik’s Cube. Colourful, visual and fun, Jugg Life was the winner of the 2015 Gasworks Circus Showdown and was nominated for Best Circus Show at the 2016 Melbourne Fringe Festival. Aged 25, Byron Hutton is a veteran performer, having toured the fringe circuit with no fewer than three shows (2014-16) in Adelaide, Brisbane, Perth and Melbourne in front of sold out crowds. His unique stage presence and juggling prowess has gained him notability in the Australian performance community, as proven by his selection to perform alongside veterans and legends in the Adelaide Fringe TV Gala. After learning to drum at age 5 and joining Tasmania’s Slipstream Circus at age 6, Joe Fisher has been performing non-stop for the 14 years since and has appeared on stages at circus festivals from New Zealand to The Netherlands, the UK’s Glastonbury Festival, The Falls Festival and as a semi-finalist on Australia’s Got Talent. 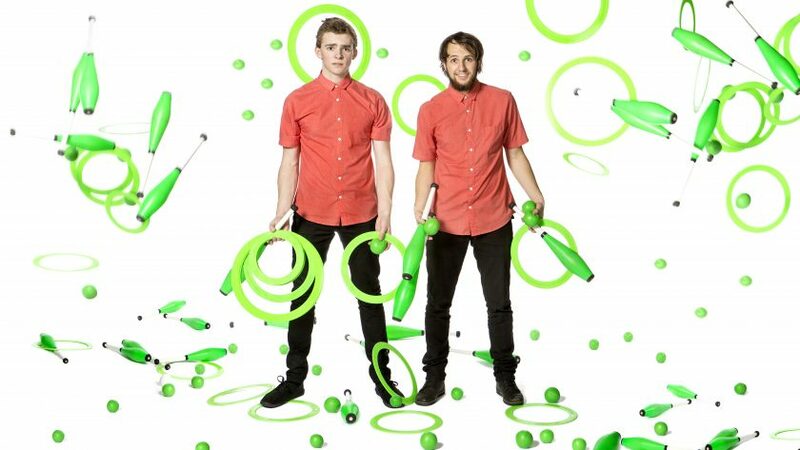 Now, after juggling alone for far too long, these two renowned performers have joined forces to create Jugg Life- a unique explosion of juggling, movement and music.